Pumpkin oil belongs to the group of oils which have a high biological value because of the favorable composition and plenty of essential fatty acids, and other components. It has a high nutritional value and a lot of active substances that have a lot of healing properties. It is mainly used unrefined, which has a pleasant taste and smell. Because of the strong anti-inflammatory effect it has a positive impact on various inflammatory processes in the body. And urinary infection, the problems of the enlarged prostate, regulates cholesterol, effectively for hair and skin. Serves as a good diuretic, has antimicrobial properties and blocks free radicals. Keep reading to learn how to use pumpkin oil as a cure for various ailments. Learn how to use it in your home. Why buy factory products when natural is always a better solution for our health. What is the composition of the pumpkin oil? Pumpkin or gourd, Latin name her Cucurbita pepo is an annual herbaceous plant native to South America. Indian natives used it in their diet a lot. Pumpkin and its seeds were used in nutrition as well as in the medicinal purposes since the time of the Aztecs. In Europe it arrived during the Columbus research and travel. The pumpkin is used in the diet, as well as pumpkin oil that is made from its seeds. It is very healthy and has high nutritional value. Often it is used as a substitute for olive oil. It has various vitamins A, D, E and K, as the B group vitamins (in particular B1, B2 and B6), and vitamin C. It also contains many different minerals magnesium, potassium, calcium, phosphorus, trace metals, copper, selenium, manganese. It is a rich source of zinc in our bodies. The amount of phytosterols is important, in particular delta-7 sterol which has various pharmacological effects. While fresh it contains 60-80 percent unsaturated fatty acids, mainly omega-6 and omega-9 fatty acids. They are essential since they are not produced in the body, so they must be taken in with food. Pumpkin oil contains a tryptophan amino acid which is essential. In addition, more lecithin, carotenoids, proteins and salicylic acid, as well as high levels of antioxidant substances. Natural and healthy is the only oil pumpkin seeds which is cold pressed, other types can even be harmful. Thus, its use in cooking is best brew for salad dressings, a variety of cooked dishes, vegetables, rice, mushrooms, pasta and meat. It is used as a spread on bread instead of butter and margarine, and in the baking industry for cakes and pastries. Pumpkin oil as a medicine provides support for a large number of problems, because of the variety of chemically active substances which are abundant in it. It is also usable in the service of beauty, because it has a beneficial effect on the complexion, helps in fighting with acne and prevents hair loss. It contains large amounts of zeaxanthin, which protects the retina from UV radiation. And reduces the risk of macular degeneration, which occurs in the elderly. Regulates cholesterol levels in the blood, because it is a rich source of alpha lipoic acid. It is an important enzyme for the proper metabolism of fats in the body, and at the same time it accelerates it. That reduces the formation of cholesterol and risk for heart attack. Increases heart health and protect the cardiovascular system from disease. It has been shown to lower blood pressure and helps in the treatment of diabetes. Due to the strong essential fatty acids pumpkin oil has an anti-rheumatic effect. Decreasing inflammation and relieving pain in arthritis and other bone diseases. In addition to protecting bones regular use can be more effective than the individual medicaments. Due to its pronounced anti-inflammatory effects, relieves inflammation all over the body. It is well known how much pumpkin seeds oil help in regulating the function of the prostate, but we will say more about it later. It promotes normal kidney function and assists in the elimination of kidney stones. It treats urethra infections in both sexes, but is effective with cystitis, bladder or inflammation. It has a strong diuretic effect, encourages the removal of excess fluid from the body. It relieves the symptoms of menopause, while in younger age it improves fertility in men by improving sperm quality. Pumpkin oil enhances the immune system, because it is rich in zinc. This mineral we need for the recovery and growth of cells. It increases physical and mental energy. It strengthens the immune system by increasing the number of leukocytes in the blood, but also participates in the restoration of red blood cells. Antioxidants contained reduce the activity of free radicals, facilitate digestion and relieves bloating of stomach after eating. So detoxify the body which helps in enhancing metabolism. It has a beneficial effect on the intestines, especially in the case of irritable colon syndrome. Pumpkin oil has anti-parasitic effect, helps the body in the killing and expulsion of intestinal parasites such as tapeworms. Believe it or not the pumpkin seeds oil is an excellent therapy to raise the mood, against anxiety and depression. Provides help for sleep, if you cannot sleep at night be sure to consume it. The main cause for insomnia is insufficient secretion of serotonin in the body. This hormone soothes and relaxes and is very important to us. Pumpkin oil contains tryptophan, which is in the human body easily converted into serotonin, enabling a restful sleep. Pumpkin oil is traditionally used both for prevention and for the treatment of prostate cancer. Studies have shown that zinc, free fatty acids and sterols in seeds work well in benign prostatic hyperplasia. Phytosterols prevent further propagation of the cells, thus regulating the problem with enlarged prostate. Studies later indicated that the oil pumpkin can improve the function of the bladder and urethra also. According to statistics, 60 percent of men aged between 40 and 59 years have a problem with benign prostatic hyperplasia. For those with over 60 years this is the case in 75 per cent. Aging decreases levels of testosterone which leads to overproduction of the hormone dihydrotestosterone, which is actually responsible for its enlargement. In addition to the unpleasant symptoms that it causes, it increases the risk for urinary tract infections as well as prostate cancer. With enlarged prostate pumpkin oil is used for therapeutic purposes. It is taken at least for three months, twice a day two tablespoons in the morning with breakfast and evening dinner. Unpleasant symptoms related to urination stop after several days or weeks, due to the antimicrobial effect which stops the inflammatory processes. However, keep in mind that this does not mean that the process of enlargement of the prostate has stopped. It is therefore very important to continue with therapy for at least 6 weeks so that the active ingredient in pumpkin oil delta 7-sterol can do what it needs to do. Such use is recommended for 6 months or even a year or two. For preventing consumed is pumpkin oil for prostate in the amount of one spoonful in the morning and evening. To make pumpkin oil we will give you some advice. 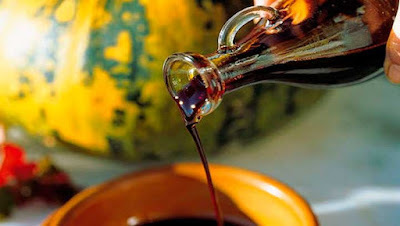 It is important to know that the pumpkin oil is produced at low temperatures without heating in the production process. After harvesting the seeds must first be washed and dried prior to storage. Cold-pressed pumpkin oil is obtained naturally from the seeds, by kneading it under high pressure without the addition of any chemicals. It contains natural essential fatty acids and retains high quality. It is kept in dark and cool place in a tightly closed glass bottle or jar. If you use a purchasable product, after opening it is best to be kept in the fridge. It is not good for to stand, because eventually it loses its healing power and nutrient composition. For a liter of oil you will you need 2.5-3 kilos of pumpkin seeds. When you remove the seeds from the pumpkin and wash them, strain them and let them to dry. Let them stand for at least 30-60 minutes. Then arrange in a baking pan, so that the seeds do not overlap. They need to be fried because from the fresh seeds you cannot get pumpkin oil. Oven heat up to 60 degrees and bake for 3-4 minutes. After frying put them in the press for squeezing under high pressure and squeeze them. If you do not have press, you can manually squeeze the oil using a mortar and pestle. When you do it, in the end it is necessary to drain it through the cloth. Palmitic fatty acids encourages the natural regeneration of the skin, providing it with a protective barrier. Stearic gives optimum humidity, which contributes to its good looks. Linoleic fatty acid is essential, so we must enter it into the body because we do not synthesize it ourselves. Plays a role in maintaining the smoothness of the skin. Oleic or omega-9 fatty acid is important for maintaining skin moisture. Pumpkin oil can be applied directly to the face and give great results. It improves the complexion, makes skin clean, has a moisturizing effect thanks to unsaturated fats it contains. It turned out as a good means of reducing the appearance of blemishes and pigmentation. Skin looks brighter, younger, is well toned and radiant. It is an extraordinary means to combat acne and pimples, not only does it remove existing, but also prevents the appearance of new ones. It effect is great because of vitamins A, C and E, zinc and omega fatty acids. That is why it is a part of many creams and lotions for skin care. Pumpkin oil is rich in fatty acids and is excellent for recovering dry and cracked skin. It is considered a natural remedy for eczema, psoriasis, lichen and peeling of skin. Pumpkin oil is a rich source of antioxidants that prevent premature aging of the skin. And with that the content of vitamin E and carotenoids slow down and mitigate the effects of aging. Therefore, this means excellent therapy against fine lines, freckles and wrinkles. Pumpkin is one of the best natural medicines that help the skin recover from various damages. It speeds up the healing process of wounds, thanks to vitamin E it reduces scars, and stretch marks. In addition, contains vitamin C, but also protects the skin. Free radicals are formed due to the harmful effects of the environment. They can, among other things invade the skin leaving it vulnerable, with wrinkles, prone to infections and other impairments. Antioxidants which are abundant in pumpkin oil protect cells and our health, removing or neutralizing the free radicals in our body. Here you can find the recipe for the tonic. Take half a cup of strong chamomile tea and witch hazel tonic and 1 tablespoon of pumpkin oil from seeds. Place it in a spray bottle and shake. Use it after cleaning and before moisturizing, so the skin can stay hydrated as long as possible. Beneficial pumpkin oil for hair also works wonders. Consume it as a supplement in the diet, a teaspoon daily with a meal. Also, after washing your hair, you can in very small amounts apply it to wet ends before drying. Also, scalp and skin of the head and massage it with pumpkin oil (the amount of about one tablespoon). Leave it for 15-20 minutes, then rinse. The problem that often has plagued a man is baldness. Regular use of this wonder of nature will prevent further decline. It is particularly effective treatment against hair loss. As a natural antioxidant it increases blood circulation in the apex and strengthens hair follicles. Therefore, you get a stronger root, accelerating its growth and also protects the ends. Makes hair shiny and control curls, so it becomes easy to handle. Deeply regenerates every hair, and so your hair will be long and strong. It gives a natural glow and healthy look. Nonetheless, thanks to its rich content of zinc it prevents dandruff. Here you can find a miracle recipe with two ingredients that help the hair grow by 2-4 centimeters in only two weeks. Pumpkin oil nourishes the hair and the essential oil of peppermint (mint) stimulates and strengthens root. Prepared so that in pumpkin oil as base you add a few drops of mint essence. This mixture must be heated on steam, and while warm rub into the scalp with gentle massaging. Then massage the head for additional 5-7 minutes, it's a trick to speed up circulation. You can immediately afterwards wash your hair or keep it overnight. So use it every day for two weeks. Results are guaranteed! Pumpkin oil is sold at almost every corner. You can find it in health food stores. It is also available in larger well-equipped shop and also on the Internet. Contraindications with preparations of pumpkin oil are not known, even after longer using. Adverse drug interactions are very rare. It can be applied to the skin or taken orally without any dilution. Only those who are allergic to a pumpkin or a substance which it contains must not use the oil. It is not recommended for use in young children and pregnant women. Only it should not be used for cooking because heat destroys nutrients. It can even become a harmful effect due to the hydrogenated fatty molecules that are formed during thermal treatment. Pumpkin oil price is quite high, and better quality one is more expensive. So packaging of 250ml it is necessary to allocate about 20 dollars, and up to 25 dollars. For some time I use pumpkin oil once a week for a massage of the head, dandruff is gone and my hair is growing like crazy. I would recommend it anyone who has a problem with the hair decline, or dry and chapped hair. I will not stop with this new ritual, they all praised me that my look is fresher than ever. And my hair just shines! M.Z. Quite by accident I came across a text about the positive effects of pumpkin oil. I had problems with urinary infections, everything I tried many things but it kept coming back. I decided to try this method of treatment, because it is completely natural. I used pumpkin oil in the morning and evening. After a while I felt improvement. Now I continue to drink one tablespoon a day purely for prevention, to prevent future infections. Z.B. Now that you found out the benefits of pumpkin oil, we recommend the article on the benefits of raw pumpkin seeds.